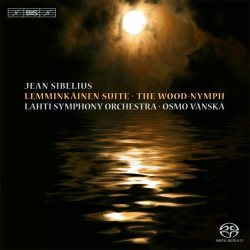 Osmo Vänskä and the Lahti Symphony Orchestra have made countless Sibelius recordings for BIS and, indeed, have recorded the works on this SACD before so it may be useful to begin by saying that, having checked with BIS, I can confirm these are new recordings which many collectors are unlikely to have. Recordings by Vänskä of both of these works were included in the outstandingly generous compilation, The Essential Sibelius (review), but in both cases those were his earlier traversals. Len Mullenger reviewed Vänskä’s first recording of the Lemminkäinen Suite back in 1999, a version that included various alternatives (BIS CD1015) and that recording, shorn of the alternatives, is the one that appears in The Essential Sibelius. Where some collectors may have encountered part of the contents of this new disc in a two-CD set, The Sound of Sibelius, released in 2010 (review). That compilation included three recordings that are also on this disc: The Swan of Tuonela, Lemminkäinen’s Return and Skogsrået. I believe that the present performance of Skogsrået also appeared in Volume I of the Complete Sibelius Edition (review). However, all those recordings have been re-mastered for this current release and now appear for the first time, for those who have the necessary equipment, in the surround sound version in which they were recorded. So, these recordings may well be new to many people, even though they have been ‘in the can’ for quite a while and it’s very good indeed that they’re now conveniently available on a single disc. They were made towards the end of Vänskä’s twenty-year tenure at the helm of the Lahti Symphony Orchestra (1988-2008) and I don’t think it’s fanciful to hear in these performances the fruits of a long partnership, especially where the music of Sibelius is concerned. We know that Vänskä is a seasoned exponent of Sibelius and in that connection I was struck by a phrase of Dan Morgan’s. Writing of the performance of the Karelia Suite that’s contained in The Sound of Sibelius collection, Dan said ‘Vänskä allows us to feel the grain of these works, the knots and whorls that are so often glossed over.’ That’s a perceptive comment and I think Dan’s verdict holds good for the present performances too. He also spoke of a ‘pleasing earthiness’ to the Karelia performance and I get that here too, though that’s not to say that there isn’t a great deal of finesse as well; it’s just that conductor and players seem to feel this music in their very bones. The Lemminkäinen Legends are superbly done here. In Lemminkäinen and the Maidens of the Island there’s excellent detail in the performance as well as a fine sense of flow. Early on Vänskä puts over the vitality and lightness in the music and is equally adept later on when the music becomes more energetic and impassioned. The clarity of the performance is helped by the splendid recording and among many other things I was impressed by the way the sound of the bass drum is reported in the pages leading up to the climax of the movement and then in the climax itself. The haunting melancholy and somewhat sinister ambience of The Swan of Tuonela really comes across. A notable feature is the bleak, plangent tone of the cor anglais, eloquently played by Jukka Hirvikangas. It’s a marvellous performance all round and Vänskä doesn’t wear his heart on his sleeve: he lets the desolate music speak for itself and this degree of restraint pays dividends. When we get to Lemminkäinen in Tuonela we find the outer sections are restless, dramatic and driven. This is a very powerful performance and once more I was conscious of how much Sibelius’ use of the bass drum adds at certain points. The anguished climax near the end of the piece is simply riveting. Then Lemminkäinen’s Return is dashing and exciting. Vänskä leads a blazing performance that’s full of swagger and derring-do. I noticed a very apt comment that Len Mullenger made at the end of his review of Vänskä’s first recording of the Legends: ‘In the same way that Rachmaninov's Symphonic Dances should not be dismissed but placed on a par with his symphonies so it should be with Sibelius' Four Legends.’ I share his admiration for the Symphonic Dances and can only agree wholeheartedly with him in respect of both composers. Indeed, when one hears a magnificent performance of the Legends, such as this present one, it’s possible to regard this excellent music almost as another Sibelius symphony in all but name. Skogsrået has a deceptively innocent title, especially in English. The Wood-Nymph might lull the unsuspecting listener into expecting a rather charming and delicate piece but nothing could be further from the truth. As the Sibelius scholar, Tuija Wicklund has said, referring to a related and unfinished work, the basic ideas of Skogsrået concern ‘love, dangerous desire and punishment’. Amazingly, the piece, never published in the composer’s lifetime, lay in complete neglect after 1899 with the exception of a single performance, incorporating large cuts, in 1936. It was not until 1996 that the present conductor and orchestra took it up and revealed its stature. They recorded it (BIS-815) but that performance, also included in the collection, The Essential Sibelius did not – could not - utilise the JSW critical edition of the score, since that was not published until 2006. For this recording Vänskä has used the critical edition. What a powerful score it is! It may not have the subtleties of some of the composer’s later masterpieces but it’s a fine, dramatic, red-blooded work, hewn from the same granite as En Saga and the First Symphony. Vänskä’s performance projects powerfully the first few minutes of the score; his reading has biting urgency and sweep. Later on the passage that includes the extended cello solo – poetically played by Ilkka Pälli – is done with fine feeling and a wonderful atmosphere. What Andrew Barnett refers to as the ‘inexorable, harrowing conclusion’ is weighty and tragic. This is a very fine performance indeed of Skogsrået. I’ve referred already to the excellence of the recorded sound but let me re-emphasise that the BIS recordings are first class. An abundance of detail registers and at the same time the listener gets the Big Picture too. In a word, the sound is thrilling. The documentation is up to the label’s usual high standards with excellent notes by Andrew Barnett. Even if this involves an element of duplication with earlier recordings this is surely a mandatory purchase for Sibelians.